"Woman, you'll be the death of me yet." "Can I make something now, papa?" 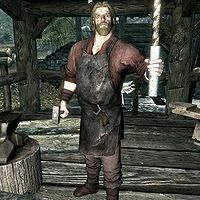 Alvor is a Nord blacksmith who lives in Riverwood. He lives with his wife Sigrid and his daughter Dorthe, and he is the uncle of Hadvar. Hadvar will send you to him after he helps you escape from your execution at Helgen. Alvor, for his part, will direct you to Jarl Balgruuf the Greater of Whiterun. After he offers you help, he allows you to take most of the items in his house as well as the ingots near his forge. If asked, Alvor will task you with creating some basic weapons and apparel using various tools as an introduction to Smithing. Alvor lives a peaceful existence in the village of Riverwood. 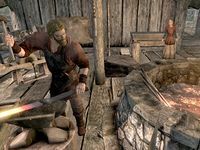 As town blacksmith, he works his forge every day between 8am and 8pm then spends an hour dining with Dorthe and Sigrid inside the house. At 9pm he visits the Sleeping Giant Inn where he socializes for two hours with the other regulars. At 11pm he returns to his family and spends an hour wandering around until he finally goes to bed at midnight for six hours of sleep. The only exception to this routine occurs if you follow Hadvar during Unbound. He will then sit at his forge 24 hours a day, waiting for you to arrive. He wears a blacksmith's apron and a pair of shoes. He carries a selection of common items and gold and the key to his house. When you approach him he will politely greet you with: "Ain't every day we get visitors in Riverwood." He will also randomly try and sell you his wares: "Whatever you need. By Ysmir, if it's simple and strong, I can forge it. ", "You lookin' for a new blade? ", "I could forge you a warhammer that would crush a giant's head like a walnut." and "You the sneaky type? Got some nice daggers around here somewhere..." Additionally, if you are playing as an elf, he will say: "Iron and steel mostly. I might even have some of your fancy Elven pieces lying around somewhere..." For all other races, he will change the greeting to: "Iron or steel is what you need. Leave that fancy Elven stuff to the Elves." When asked, he will also tell you about his home town Riverwood: "Gerdur's family first settled here as wood cutters a few generations ago. She and Hod run the mill. I make a decent living sharpening axes and fixing the sawmill." You may also ask him if you can use his forge: "I see no harm in it, if you have the skill. The grindstone will improve your weapons. Use the table to improve your armor. If you've got the raw materials, you can use the forge to make something new." If you choose to follow Hadvar during Unbound, Alvor will have a lot more dialogue options. See this section for details. Alvor: "Sigrid! Love of my life! When you get a spare moment, I could use some water." Sigrid: "Don't you sweet talk me, Alvor. Not after last night. I'll bring you water when I'm done with my other chores." Alvor: "Woman, you'll be the death of me yet. Fine, take your time. I'll just die of thirst in the heat of this forge." Sigrid: "I've got some fresh cabbage. I'm thinking of making some apple cabbage stew." Alvor: "Dorthe won't eat that. Are you trying to starve the child?" Sigrid: "She needs to learn to eat what I serve her. I swear, you spoil that child rotten. Besides, it's one of your favorites." Alvor: "Ay, it is. I suppose it won't hurt the girl to eat it this once. And speaking of spoiling Dorthe, who made her a new doll last week?" Sigrid: "Just never you mind about that." Dorthe: "You really think I can be a blacksmith someday, papa? As good as Eorlund Gray-Mane? Or maybe... even as good as you?" Alvor: "Oh, I know it! You keep working hard, like you been doing, and you could be the greatest blacksmith Skyrim has ever seen." Dorthe: "He he. Thanks, papa." Dorthe "Can I make something now, papa?" "Is it time yet? Time for me to make my sword? Or maybe... an axe?" "I'm bored standing around, papa. I could take over for you..."
Alvor "Later, little one. I need to finish what I'm working on. But keep watching. Watch, and learn." "He he. Not just yet, Dorthe. I need to keep forging, and you need to keep watching." "Patience, Dorthe. You'll get some time at the forge, I promise you. But not right now. You need to keep watching me. That's how you'll learn." Dorthe "Don't worry, I am." "All right. But I am getting a bit tired of waiting." 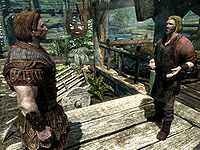 If you escaped Helgen with Imperial Legion soldier Hadvar, you will be pointed towards Alvor in Riverwood, who turns out to be Hadvar's uncle. You can choose to run ahead and talk to Alvor before Hadvar reaches him, or you can wait for Hadvar to catch up. If you run ahead and tell Alvor that Hadvar sent you, he will reply: "Hadvar? How do you know him?" Two options will now be available; if you choose to tell him you're a friend of Hadvar, he will respond: "I'd be glad to help a friend of Hadvar. But you didn't answer my question - how do you know him?" If you tell him Hadvar helped you escape from imperial custody he will be understandably suspicious: "Did he, now? That doesn't sound like my nephew at all. I doubt he'd be mixed up with the likes of you." You can now choose the option 'never mind' and Alvor will apologize: "Suit yourself. I hate to turn away any friend of Hadvar, but in times like these... you understand if I can't just take your word for it." When you finally tell him about the dragon attack on Helgen and your heroic escape along with Hadvar, Alvor will be shocked: "What? A dragon? In Helgen? That explains what I saw earlier... flying down the valley from the south... I was hoping I was wrong about what I thought it was..." When you confirm that it was a dragon he will respond: "A dragon... here in Skyrim. What's this world coming to? First the war, now dragons... trouble loves company, they say..." Lastly, he will admit that he saw the dragon: "You're right, I saw it. Didn't want to believe my own eyes, is all. The Jarl needs to know if there's a dragon on the loose. 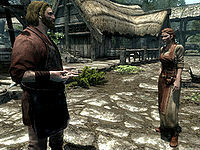 Riverwood is defenseless... We need to get word to Jarl Balgruuf in Whiterun to send whatever soldiers he can. If you'll do that for me, I'll be in your debt." This will provide your next objective of the quest. "Shor's bones, what happened to you, boy?" "A dragon? That's... ridiculous. You aren't drunk, are you boy?" Hadvar: "He's/ She's a friend. Saved my life in fact. Come on, I'll explain everything, but we need to go inside." Alvor: "Okay, okay. Come inside, then. Sigrid will get you something to eat and you can tell me all about it." OR "Come on inside. Sigrid will get you something to eat and you can tell us what happened." Once inside, Alvor will summon his wife with the words "Sigrid! We have company!" and will then take a seat opposite Hadvar. Alvor will then seek you out and repeat: "Like I said, I'm glad to help in any way I can. Help yourself to whatever you need, within reason. But I need your help. We need your help." You can then look through his inventory for supplies; once you're done, he will continue: "The Jarl needs to know if there's a dragon on the loose. Riverwood is defenseless... We need to get word to Jarl Balgruuf in Whiterun to send whatever soldiers he can. If you'll do that for me, I'll be in your debt." He will then provide a wealth of information, including the easiest route to Whiterun: "Cross the river and then head north. You'll see it, just past the falls. When you get to Whiterun just keep going up. When you get to the top of the hill, you're at Dragonsreach, the Jarl's palace." He will also tell you about Jarl Balgruuf: "Jarl Balgruuf? He rules Whiterun Hold. A good man, perhaps a bit over-cautious, but these are dangerous times. So far he's managed to stay out of the war. I'm afraid it can't last, though." He will then introduce the civil war by explaining the jarl's political stance: "I don't think he likes either Ulfric or Elisif much. Who can blame him? But I've no doubt he'll prove loyal to the Empire in the end. He's no traitor." When asked about his own stance on the conflict, Alvor will reply: "Of course. Skyrim has always been part of the Empire. 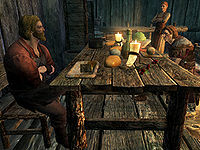 That doesn't mean I support everything the Empire's been doing lately, but Nords have never been fair-weather friends." He will also explain about Elisif: "Ah, I forget you're new to Skyrim. Jarl Elisif, I should say, although only because she was married to Jarl Torryg when he was murdered. Ulfric murdered Torygg, you know. Walked right into his palace in Solitude and killed him. Shouted him to death, if you believe the stories. That's what started this whole war. The Empire couldn't ignore that. Once the jarls start killing each other, we're back to the bad old days." On the civil war as a whole, he will provide his personal opinion: "People are rightly stirred up about the damn Thalmor being allowed to roam around arresting people, just for worshipping Talos. But was it worth tearing Skyrim apart, and maybe destroying the Empire? No, Ulfric will have a lot to answer for in the end. Nords have always supported the Empire, and the Empire has always been good for Skyrim." When you ask him why the Thalmor have a right to arrest Talos worshippers, he will say: "It's from that treaty that ended the Great War, remember, when the Emperor was forced by the Thalmor to outlaw Talos worship. We didn't pay much attention to it when I was a boy - everyone still had their little shrine to Talos. But then Ulfric and his "Sons of Skyrim" started agitating about it, and sure enough the Emperor had to crack down. Dragging people off in the middle of the night... one of the main causes of this war, if you ask me." With these words, he will leave the house and return to his regular duties again. This is the merchandise found in Alvor's merchant chest. These items are only available if purchased from the merchant; they cannot be pickpocketed or stolen. They are restocked every two days.